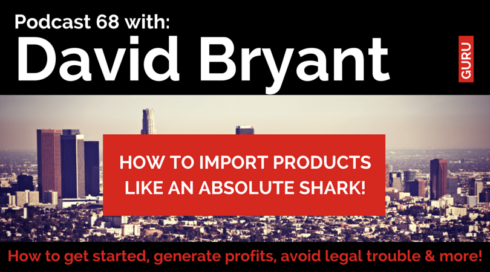 We’re super excited to have an absolutely killer guest today: David Bryant from ChineseImporting.com. Some people, though, are just so far ahead of the game when it comes to important products from overseas. David is one of those people. Just how far ahead is he? You might want to sit down. Starting in 2008, David built a business that now sources over 300 products from China and generates over $1 million in annual revenue. The crazy part? He’s only 30 years old! That’s what you call a whiz kid. David’s here to school us in the importing arts. So check it out and listen up. When and why did you get started importing products from China? First, David’s always been an avid traveler and backpacker. When he was in college, he went to China, mostly for fun and to see the sites. But when he first landed in Shang Hai, there happened to be a big boat show. David’s family have always been boaters, so he figured he’d stop buy. When he got there, there were boats, of course, but there were also loads of Chinese suppliers selling different boating products. He talked to a few different suppliers, but he really hit it off with one gentleman in particular. The supplier was selling a table and chair set that went on the patio of a boat. So David asked the guy if he could get couple samples to take back to Canada to try to sell. Good idea, right? Well, there was a problem: they weighed about 60lbs and were roughly four feet long (keep in mind that David was at the very beginning of his trip). So for the next four weeks, David lugged a 60lb patio set all around China. But eventually, he got them back to Canada. He got the samples for free (the normal cost was about $40), put them on eBay, and sold them for $200 in just a couple days. So, David contacted the supplier and asked for a few more to try to sell. Of course, the supplier was happy to ship him some more, and David moved that shipment out the door almost as fast as the first. Fast forward 10 years, and David has a full-time eCommerce business and is still working with that original supplier (in addition to many others, of course). In fact, he imports nearly 100 different products from same awesome guy he met on that first trip to China. So, really, David kind of… stumbled into this whole business. He wasn’t looking for a specific product. He didn’t set out to do eCommerce, he just made a friend and gave it a whirl. And just how well is your business doing? Right now, David’s business generates just over $1 million dollars in revenue a year. Roughly 80% of that comes from online sales. The other chunk comes from wholesale and trade shows. The coolest part? David’s business grows nearly 50% every single year. David has three people working in his office to handle order support, customer service and marketing. The fulfillment is handled mostly by a warehouse that David rents. Where are you selling online? Are you doing business on Amazon or through your own websites? When David first started, he was selling almost exclusively on eBay and his own website. Nowadays, though, Amazon is proving to be a high-value platform and is becoming a bigger and bigger part of his business. So today, it’s kind of an even split between David’s website, eBay and Amazon. One of the interesting things about David’s Amazon arm, though, is that he sells products to Amazon wholesale, which represents an every-growing percentage of his business. You mentioned the industry you started in (boat stuff). Are you still in the same industry? Yep; the core of David’s business is still boating supplies, although they’ve branched out into other outdoor recreation areas, like camping, fishing and RV supplies. Boating’s still the core, though. Alright. Let’s get to the meat and potatoes here. Let’s talk about sourcing products from China. Our process is basically to source products through Alibaba and sell them on Amazon. Of course, we’re newbies. So what’s your process for finding and sourcing products? In David’s view, the easiest way to find a niche in which to source and resell products is to start at your own hobbies and passions. It’s no accident that David stated with boats and stuck with it. He’s always been around boats. His family has always been boaters. He knows boats. He knows the people who like boating. So it was very natural for him to start there. Or, for example, David’s friend was a semi-truck driver, so he started importing semi-truck wheels—it was something he already knew a lot about. But here’s some more specific advice David usually gives to people looking to get into eCommerce: pick a niche that’s a mile wide as opposed to a mile deep. Let’s look at two markets: marathon running vs. mountain climbing. If you wanted to get into the running niche and sell stuff to marathon runners, there are basically two things you can sell: shoes and water bottles. That’s pretty much it. If, on the other hand, you wanted to get into the mountain climbing niche, you should sell them all kinds of stuff: ropes, harnesses, shoes, sleeping bags… and dozens and dozens more products. One of these niches is clearly better than the other. In other words: pick a niche that has a lot of different possibilities for add-ons and accessories. Aside from simply having more selling opportunities, here’s the even more important reason behind that strategy: if you’ve got a good supplier from whom you’re already sourcing a product in a particular market, chances are good that they also dozens (or even hundreds) produce other products in the same market, making it very, very easy to expand your product lines. That’s great advice, and being passionate is awesome. But what about market research? How do you know that if, say, you go into mountain climbing, you’ve got a reasonable chance of success? How do you decide whether or not you can break into a market? Well, first, according to David, you can just do some simple browsing. Take a look at the products in the market you’d like to break into. See what’s selling well. See what the reviews say. See what the price is. The problem with that, though, is that if a product starts to do really well on Amazon or eBay, people will notice, and in a couple of months, you’ll start to see a bunch of other folks selling the same thing and undercutting each other. But that’s one strategy, and it can work. What David prefers to do, though, is (1) follow his gut and (2) test products in small batches. So, he might be perusing his supplier’s catalog, using his experience in a market as a kind of eCommerce divining wand. When he finds something he thinks might sell, he’ll try to order as few of that product as he possibly can—we’re talking batches as small as 5 or 10 products. Then, he’ll test the products sell-ability on Amazon or eBay. If they sell, he’ll simply order more. Here’s the main benefit of this strategy, though: you can often find products offered by your supplier that no one is seriously selling on the major online platforms. This gives you a massive head start over other retailers, and you can sometimes enjoy several months of blue-ocean selling in which you’re the only person selling that thing. And that, my friends, is what a profitable opportunity looks like. Awesome. That’s fairly different that what a lot of folks are doing. So you’re not heading over to Amazon, looking at the Best Seller Rank (BSR) and doing a bunch of fancy formulas? Correct. The power of David’s bread-and-butter strategy is in testing super small batches live in the marketplace. That tends to work really well in David’s market, since there can be major variations for products (stuff tends to be very different for small boats as opposed to big boats). But that’s the idea: don’t just sell copies of the top sellers. Sell the same type of thing but with a twist. Let’s talk about the sheer number of products you sell. We’ve chatted with several people who put a lot of stock into having a few highly-profitable products. You seem to cast a wide net instead, and as long as a product is profitable, it doesn’t necessarily matter if it’s making thousands of dollars a month. Is that right? That’s definitely the strategy David prefers. His business sells hundreds of products. For some of those, he’s luckily if he sells even a few per month. But with such a huge portfolio, that doesn’t matter much, since the total number of units sold across the entire business is really high. And there’s another upside: in David’s experience, people who sell more products have less risk and tend to stick around longer—mostly because you’re not totally crippled if one of your products tanks. Let’s talk logistics. Suppose we’ve found a market we like. How do we find a manufacturer in China? There are more or less four different areas you can look for a supplier. Go to tradeshows and meet people. Go 100% online with Alibaba (and similar sites). Competitor research (figuring out your competitor’s suppliers). Now, of those, Alibaba is the most popular (in our circle of friends), and David recommends this for people new to online business (just be sure to get a handful of quotes from a handful of different suppliers and pay special attention to “Gold” suppliers). Still, David warns not to discount the other methods. For example, more and more Chinese suppliers are attending American tradeshows, making them much more convenient than they may have been in the past. This gives you opportunities to meet people in person who are specifically looking for people to import their products. Or, if you do want to go to China, this may be a better way, according to David. There are literally thousands of tradeshows in China every year, and you can often find lots of good stuff. The biggest benefit? Making real friendships. Remember, David’s been working with the same supplier for almost a decade. Have any other Alibaba tips? Get a handful of quotes from a handful of suppliers to make sure you’re not getting ripped off and to get a good price. Pay special attention to “gold star” suppliers, since they tend to be more professional. Filter your searches by country. What about sourcing agents? Why and when should you use one? You generally want to use a sourcing agent if you have a really firm idea of a specific product you want, but you can’t find it anywhere. You might also want to use a sourcing agent if you’re really, really concerned with quality. Sourcing agents can help with both of these things. Of course, it’s not cheap. These folks take a 10%-30% commission of each sale, and they’ll typically hide the factory they’re working with so you have to keep using them. Lots of times, these agents will be based in Canada or the United States, so they’re easy to work with. The best way to find these is usually just good old fashioned Google. Usually, agents will specialize in a particular field. What about original product ideas—unique stuff you want to have manufactured. How would someone do that? What David’s done in the past is to find a product he wants a variation of and send a sample to his suppliers. Typically, suppliers like this sort of thing and get really excited about producing something new. If you have a totally unique product, you definitely want to work with a sourcing agent, since there’s so much potential for miscommunication. Awesome. Now, let’s suppose someone’s found a product and a supplier. What can they do to make sure they’re getting a good deal? First, make sure you compare quotes to make sure you get (more or less) a fair price. Second, wait until you place a real order to negotiate prices. If you try to haggle them down when you’re just ordering a sample, they might just stone-wall you. Suppliers in China usually aren’t hurting for business, and many are picky about who they choose to work with. The easiest of those to negotiate is freight. A lot of times, instead of negotiating price, David will just ask, “Can you include the freight to Vancouver?” For whatever reason, suppliers tend to be more open to paying for freight than coming down on price. So ask for free freight. How’s that work? We’re using a shipping agent, and that agent arranged the shipping. Who are you negotiating with? But you can also simply ask your supplier to arrange the freight. Hopefully, they’ll give you free freight, but even if they don’t you can ask them to arrange the shipping and just bill you for it. And what’s the trick to get lower minimum order quantities? This is one of the biggest challenges when importing from China. Often, on marketplaces like Alibaba, you’ll run into absurd minimum order quantities (who can sell 10,000 tennis rackets?). There are a few ways to deal with this, according to David. First, you can simply ask to pay a higher price or a small surcharge for the smaller order. Second, you can ask to have your product produced with another customer’s order. And lastly, you can just build a friendship with your supplier. This is the same in any area of business: friends are always more likely to do you favors. This is the same kind of thing with delivery time? This is a really big challenge. Almost every supplier will promise to deliver products in 30 days or less. This almost never happens. Hitches come up. So here’s a tip: put a penalty in to the contract for late delivery. If the product is one week late, you get a 1% discount. If it’s two weeks late, you get a 2% discount. And if the order is three weeks late, it’s simply canceled. Here’s what this really does. If you have a penalty clause in your contract and another retailer does not, your supplier will often prioritize your order. You mentioned looking at a supplier’s catalog. Do you go through catalogs and ask about their best selling products? Yep. However, you usually need a relationship to do this. Most suppliers are very hesitant about sharing their full catalog and price list, so don’t ask up front. Wait until that first order goes through, and you’ve established that you’re a serious buyer. Let’s talk about shipping methods. We ship via sea freight. What do you use? Do you ever use air? The big difference between the two, of course, is speed. We’re talking up to a 60-day difference. That said, sea freight is cheaper than air freight. Here’s a rule of thumb: if it’s over 300lbs, ship it via sea freight; if it’s lighter than that, use air freight. Now, you might think that you can cheap out and use sea freight all the time. The problem is that there are a lot more fees with sea freight, so even though it’s cheaper to ship, you may pay an extra $500-$1,500 in fees (customs brokers, docking fees, etc.) when it arrives. If you don’t know which shipping method to use, David’s got a handy calculator on his site here. As we start to wrap it up, let’s talk about profit potential. How do you run the numbers to figure out if a product is worth going after? These days, David tries to find products he can sell for at least three times what he pays for it. David points out that we live in a free shipping world. If someone buys something from you online—especially through a big marketplace like Amazon or eBay—you’re going to be expected to pay for the shipping. On average, shipping fees represent a good chunk of the total cost to the business. Because of this extra cost, David’s rule of thumb is to find products he can mark up about three times the base manufacturing cost. For example, if you can buy a product for $100, you want to be able to sell it for a minimum of $300. In the end, you want to walk away with about 20%-30% of the total cost in your pocket. Lastly, how do you fund your business? Where do your profits go? How much do you reinvest? David reiterates that this can definitely be a money-sink. You need money to buy inventory. This is something all retailers have always struggled with. There are a few options. First, you can bootstrap: reinvest the profits continuously for a long time until you’re at a level at which you’re comfortable taking money out. Second, if you’ve grown enough that you’re placing big orders, you can ask for credit from your suppliers. Third, most companies have an “inventory sweet spot,” a point at which you’re not holding onto more inventory than you need to while still keeping your products in stock. Other than that, it’s just one of the challenges of this business model. It’s a capital-intensive business, and you should definitely prepared for it going in. Overall, we were super stoked to have David on the podcast. If there’s any eCommerce/importing guru out there, it’s David. You can follow along with David on his blog at ChineseImporting.com. David's handy Minimum Product Costs Workbook. Freighteo: A service to quickly calculate shipping costs. Calculator to figure out duty rates: Duty Calculator. What have you guys been up to? Do you have any other questions? Let us know in the comments! Very good. I’m starting in the import business, in my case I am importing to sell in Brazil, where the value is higher there, and I get a spread of far greater profit. Wow, this is really huge. I’m already salivating here :). David is really raking it big and I’m happy for that. Thanks Spencer and Perrin for this awesome information. However, I still believe that getting all these together requires a huge investment and mostly, not what an average man can do but, I’m considering checking it out soon. One question I’ll love to ask you guys though is, can you please give a rough estimate to the minimum investment an average guy is expected to put into this while starting, just to test the water ? I’ll really appreciate your response to this. Thanks for sharing and you all have a lovely weekend. I started my first product with about $2,500 invested or so. Some start with less…but having $5k to invest is a good start. There are plenty of people who start with under $1000 but you’re restricting yourself to light weight, low value items that can be sent cheaply via air. Once you start getting to the point where you need sea freight, $2.5-5k like Spencer mentioned is a good target. This is great post for new people who want to import products. I will share this post for new people. Thanks for this detailed post. Keep posting. Is there any way to know which trade show is going on in China right now? I mean any website or anything where they let us know about the trade shows? Probably. But I haven’t researched that before. http://www.chinaexhibition.com/ is a great place to start. It’s fairly exhaustive, however, if you know the niche/category you want to be in your best bet is to simply google “ice cream [or whatever product] trade show china”- there’s almost always a trade show devoted to your niche somewhere and some time in China. What is the profit margin on the $1 million? Is that $200,000? $500,000? Just so it is clear? Stay away ? So do you mean the above guy isn’t making profits? I guess if one is passionate than of course he can go into it and yes its a great profitable business today. Yes but your titles are exaggerated. I am not being negative here but I am seeking the truth. So net profit is between $150,000-$350,000. Anyone serious about business wants to know exact numbers. Those who have specific goals. I agree all products are different and all people building the businesses are different and all niches can bring different results. But at least now I have a better understanding of what is required to create a million dollar a year business. Most like more than one niche product. I keep margins private and needless to say, $1million of revenue is not profit. With that being said, average gross margins in importing and private labeling should almost always be greater than 50%. Net margins, depending on your overhead and other factors, normally fall in the 15-35% range. Truely amazing after reading this I too wish ti start importing business in future a profitable ones. Thanks for such a well explained I love reading this. Nice! As being a Chinese, im sooooo glad to see some guys is open like david and making ton of money, and i want to try to say here, not all China-made goods are fake and junkie, you just need time to pick the good ones! Very true. Plenty of high quality products are made in china…including iphones. And now for the last step I do not know exactly , when in these 5 steps I have to pay for something and how? How do I pay the carrier, customs, etc…?